Do you have a sample application illustrates the use of the OSS ASN.1 Compiler to compile a simple ASN.1 module, and the use of the OSS runtime APIs to invoke the Extended-XER (XML) encoder/decoder? The following sample application illustrates the use of the OSS ASN.1 Compiler to compile a simple ASN.1 module, and the use of the OSS runtime APIs to invoke the Extended-XER (here after called E-XER) encoder/decoder. The C application program in this example is tebcas.c and the associated ASN.1 source file is ebcas.asn . This ASN.1 file contains a value notation myCard. The application program encodes this value ( myCard ) using E-XER, and then decodes the E-XER encoded data into structures. The following outline shows how you can produce and run a sample executable program that encodes and decodes a message using E-XER (Extended XML Encoding Rules) . The following describes how to compile the abstract syntax defined in the ebcas.asn file. TEXT BBCard.handedness:left-handed AS "left handed"
TEXT BBCard.handedness:right-handed AS "right handed"
The following command compiles ebcas.asn, and generates ebcas.h and ebcas.c files. The ebcas.h file contains the structures corresponding to the components of ASN.1 file. The ebcas.c file contains information needed by the encoder and the decoder at runtime. The file, ebcas.c, must be compiled and linked with the sample application. The -exer compiler option notifies compiler that E-XER (Extended XML Encoding Rules) will be used at runtime. 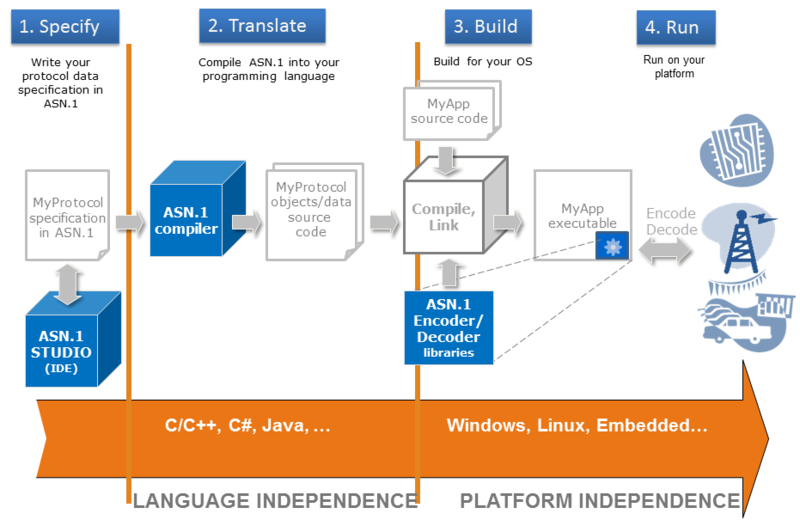 A detailed description of all the compiler options supported by the OSS ASN.1/C Compiler can be found in the OSS ASN.1 Compiler for C Reference Manual. The ebcas.c file contains the information needed by the runtime APIs to encode and decode PDUs. Since this file contains internal information, it is not shown here. This file must be compiled and linked with the sample application. The following C program, tebcas.c, encodes the PDU described by the ebcas.asn abstract syntax using E-XER (Extended XML Encoding Rules), and then decodes it. Note that ebcas.h (generated by the compiler) has been #included in the application program. This header file contains the generated declarations for the application. (The function calls to the OSS Encoder/Decoder functions are in bold font.) After the application program is compiled, the OSS Encoder/Decoder runtime library must be linked into the resulting executable file. The OSS ASN.1/C compiler generated file ebcas.c and application program tebcas.c should be compiled and linked to generate the sample executable program. The easiest way to compile and run the sample program is by using the makefiles (asn1cpl.mak andtebcas.mak) under the samples directory of the OSS ASN.1 Tools for C. The asn1cp.mak file compiles the ASN.1 syntax and generates .h and .c files. The other makefile, tebcas.mak, compiles application code with the generated .c file, and links the object file with the OSS runtime libraries to generate a sample executable. These files are located under the samples/xml/extended-xer directory. For example, if you have installed OSS ASN.1 Tools for C under the /ossasn1/win32/7.0.0 directory, these makefiles can be found under the /ossasn1/win32/7.0.0/samples/xml/extended-xerdirectory.